From braids to breeds, fetlocks to forelocks, and gates to gaits, the equestrian vocabulary is vast, colorful, and precise. This revised and updated edition of the classic treasury is the definitive source for understanding it all. 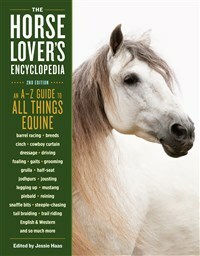 Lifelong horse lover Jessie Haas is the author of 38 previous books, including many children's books focused on girls and horses. Haas lives in rural Vermont with her husband, Michael, and two Morgan mares.